8 torches, with shining, radiant flames, parading down the street. Parading through the streets of small town, America. The streets of a city with strong values. Secular values. Ethical values. Moral values. But not known for Jewish values. But there they were. The torches raised up high. Held by the future of the Jewish people. The Jewish children. They marched proudly, leading the procession. Followed by a truck, emblazoned with signs marking the Torah Dedication Ceremony. With live music, blaring Jewish melodies. And there, flocked by the Jewish community, the Torah was proudly paraded through the city streets. Crowned with a magnificent silver headpiece. Wrapped in a coat befitting royalty. There, surrounded by joy and pride, was the Torah. The Torah, the gift Hashem gave to the Jewish people. The very same Torah received at Mount Sinai, rewritten once again, for our community. The joy was palpable. Cars slowed to watch the procession. History was being made, and you could feel it. The crowd was so diverse; people of so many different beliefs, and some with no belief at all, yet here we were one. One people. One Community. One Torah. And the torches burned proudly. Am Yisroel Chai! How did it happen? How did we get to this day? I was struck by that thought that almost every person in the crowd has an ancestor; one, two or three generations back, who was ready to sacrifice their life for the very same Torah. For mitzvos. For a relationship with Hashem. They valued it and lived for it, and that’s why we still exist. This is truly the hand of Hashem. A hand that cares for each and every one of us, a hand that holds us strong, even when we feel alone. A hand that directed me and my family to Folsom, California, and who directs each member of this wonderful community. And I watched my children, beaming with pride. My 9 year old. He was a strong supporter of the Torah campaign. He had watched the numbers on the website banner go up with each donation, getting closer to our project goal. At one point, he noticed we were $44 away from the next $100 mark. He was hooked. He was adamant. He wanted to participate. He was so proud. He was so attached to the Torah. And despite his dreams of mega lego sets and other things important to a 9 year old, he begged to take $44 from his bank account and contribute. And he did. So proudly! 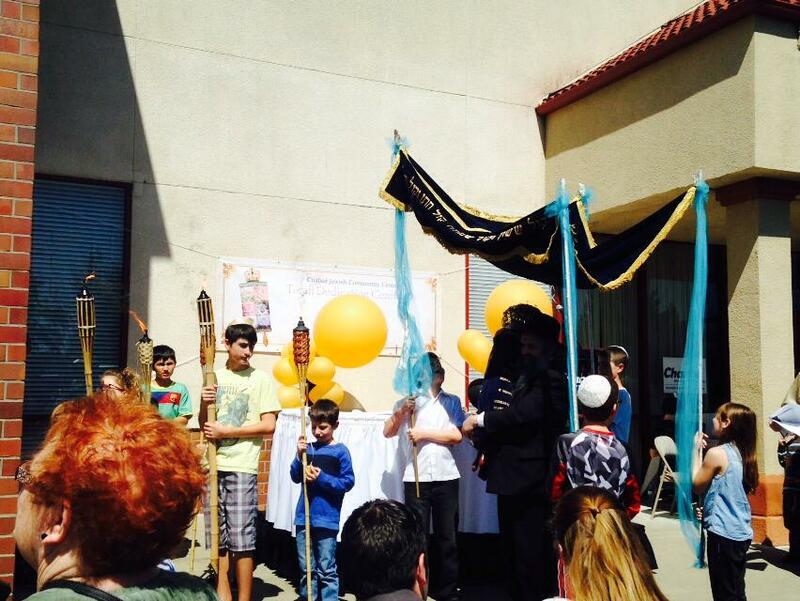 And as the youngest donor, he was honored with dressing the Torah in its royal garb. The joy on his face. His love for Torah was ablaze. His heart shined like one of the torches. We were all torches yesterday, lighting up each step of the parade route with the love for Torah. Lighting up each step with a pride for our identity. For a pride deeper than anything else that exists. A pride from our core. Our very DNA. And we danced in the parking lot. The women danced together. The men danced together. We danced for ourselves. We danced for the Torah. We danced for the joy of the moment. But most of all, we danced for the future. And I silently prayed that each person there would pack up some of the joy and pride in a box, take it home and keep it. Not as a relic of the past, but as an energy for the future.